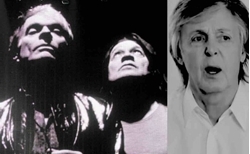 Van Halen Icon Reveals Dark Truth About Paul McCartney . Beatles Radio: The Beatles, Solos, Covers, Birthdays, News The Fab 4 and More! In a new interview with Joe Rogan, Van Halen frontman David Lee Roth revealed the truth about how Paul McCartney and John Lennon created the dark sound within The Beatles, and how their balance helped create it. Alternative Nation transcribed Roth and Rogan’s comments. Roth: We will do it in the old Beatles style, here is the best way to go for somebody that’s interested [in Jazz]. The old Lennon note and McCartney note. The McCartney note is always kinda happy. I’ve actually bumped into Sir Paul over at Henson Studios and he’s really happy.